In this report we examine the digital transformation of Ukrainian society and business in comparison to the EU countries. We present the importance of digital development in the context of ongoing reform process in Ukraine, the current state of ICT infrastructure (fixed and mobile broadband Internet) and the usage of digital technologies by enterprises. The presented statistics aim to demonstrate the usage of digital technologies in Ukraine in comparison to the corresponding indicators within the ‘New Member States’ of the EU (NMS13) and the ‘Old Member States’ (EU15) in 2015. The goal of this assessment is to identify the gaps and to project what needs to be done in order to achieve the average European level. The analysis is restricted to SMEs (firms with 10–250 employees). Furthermore, the selection of evidence is strongly limited by the availability of the methodologically comparable data of the State Statistical Committee of Ukraine. This is the first study that compares and reflects on the existing gaps of business digitalisation in Ukraine and their European counterparts. It is crucial to attract attention to the digital transformation of SMEs in Ukraine, as they are often unable to finance costly investments by themselves, thus their developmental needs require more attention of Ukraine’s government and international aid donors. The Internet and the usage of digital tools became a must for businesses during the ongoing digital revolution. The European Union’s goal is to become the world leader in the digital economy by the realisation of the Digital Single Market (DSM) strategy, proposed by the European Commission. The regulations proposed within the DSM greatly enhance the opportunities stemming from successful digital transformation for citizens and enterprises, however, it also pose risks connected to losing markets and customers due to digital business illiteracy. The digital revolution affects both digital and traditional businesses, especially SMEs, which are relatively more sensitive to global competition compared to larger, well established firms. The digital revolution is a chance for Ukrainian SMEs to close the technological gap towards more advanced countries and fully reap the benefits of the economic integration with the EU. Are Ukrainian SMEs ready to compete on European markets? Ukraine has been coping with many challenges since the signing of the EU-Ukraine Association Agreement in 2014. Ukrainian firms not only have to adjust to the digital revolution, but also manage significant changes in the economic system including a tax reform or the partial elimination of duties on trade with the EU. 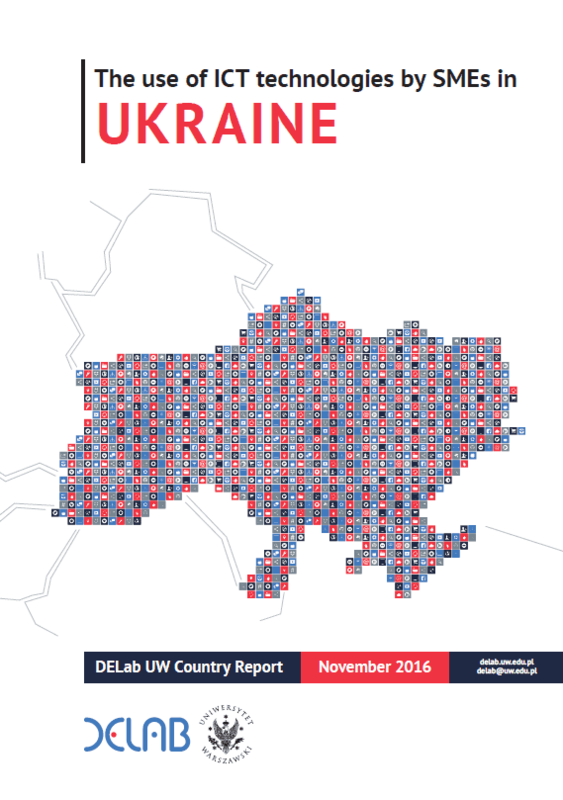 Overall, Ukraine is lagging behind the EU average in digital development, however, positive trends can be identified. The available ICT infrastructure is poorer than in the EU, especially regarding mobile broadband. Ukrainian labour market is characterised by a high and growing number of IT specialists, but the diffusion of digital infrastructure and skills among employees of SMEs is quite low in comparison to European level. A modest share of Ukrainian SMEs run a website or use the social media when compared with the EU average. They do not take the full advantage of the potential that the digital tools unlock, e.g. to communicate with customers and partners, to promote the image of the company and its products or to build relations with the potential labour force, suppliers and financial institutions. Ukrainian SMEs should get on a stable path of persistent adoption of digital technologies in operations and digital skills among employees to face the challenges of competing on European markets.